1دانشجوی کارشناسی ارشد، کارشناس مسئول تغذیه حوزه معاونت بهداشتی، دانشگاه علوم پزشکی رفسنجان، رفسنجان، ایران. 2مربی، گروه آموزشی پزشکی اجتماعی، مرکز تحقیقات محیط کار، دانشکده پزشکی، دانشگاه علوم پزشکی رفسنجان، رفسنجان، ایران. 3استادیار، گروه آموزشی اپیدمیولوژی، آمار زیستی و مرکز تحقیقات محیط کار، دانشکده پزشکی، دانشگاه علوم پزشکی رفسنجان، رفسنجان، ایران. 4دانشجوی دکتری اپیدمیولوژی، کارشناس سالمندان حوزه معاونت بهداشتی، دانشگاه علوم پزشکی رفسنجان، رفسنجان، ایران. مقدمه: با توجه به نقش کارکنان مراقبت­های اولیه بهداشتی در تغییر رفتارهای تغذیه جامعه، هدف این مطالعه تعیین دانش، بینش و عملکرد تغذیه­ای کارکنان مراقبت­های اولیه بهداشتی شاغل در دانشگاه علوم پزشکی رفسنجان در سال 1394 بود. مواد و روش­ ها: این مطالعه توصیفی- مقطعی با روش سرشماری بر روی 289 نفر از کارکنان بهداشتی شامل کارشناسان، کاردانان و بهورزان شاغل در دانشگاه علوم پزشکی رفسنجان انجام شد. پرسش‌نامه دموگرافیک و پرسش‌نامه ساختارمند در مورد آگاهی، بینش و عملکردتغذیه­ای به صورت خودگزارشی تکمیل گردید. داده‌ها با استفاده از آزمون­های مجذور کای، دقیق فیشر، آنالیز واریانس یک‌طرفه و آزمون مقایسات چندگانه توکی تجزیه و تحلیل شدند. یافته ­ها: میانگین و انحراف معیار آگاهی و عملکرد کارکنان به ترتیب 79/5 ± 33/31 (از 46 نمره) و 60/2 ± 31/14 (از 20 نمره) بود. به ترتیب، سطح آگاهی و عملکرد 1/29 درصد و 2/33 درصد از شرکت‌کنندگان در سطح عالی مشاهده شد. بین آگاهی و ویژگی‌های دموگرافیک از قبیل جنسیت، سابقه کار، مدرک تحصیلی، رده شغلی و وضعیت استخدامی ارتباط آماری معنی‌داری مشاهده شد (001/0>p). بین عملکرد و جنسیت (001/0=p)، رده شغلی (002/0=p)، سابقه کار (001/0>p)، مدرک تحصیلی (037/0=p) و وضعیت استخدامی (003/0=p) نیز ارتباط معنی‌دار بود. بینش کارکنان نسبت به 8 سؤال نامطلوب (9/77% - 9/42%) و برای 23 سؤال مطلوب مشاهده شد (5/96% - 1/62%). نتیجه ­گیری: سطح آگاهی و عملکرد کارکنان در محدوده خوب تا عالی تعیین شد. به نظر می‌رسد برای گروه‌های زیر دیپلم و به ویژه بهورزان مرد، کارکنان رسمی و با سنوات خدمتی بیشتر، بایستی در نحوه برگزاری کلاس‌های آموزشی تغذیه تجدیدنظر نمود. 1MSc Student, Expert nutrition, Rafsanjan University of Medical Sciences, Rafsanjan, Iran. 2Instructor, Academic Member, Occupational Environment Research Center & Dept of Social Medicine, Medical School, Rafsanjan University of Medical Sciences, Rafsanjan, Iran. 3Assistant Prof, Dept of Epidemiology and Biostatistics, Occupational Environment Research Center, Medical School, Rafsanjan University of Medical Sciences, Rafsanjan, Iran. 4PhD student of Epidemiology, Elderly Expert, Rafsanjan University of Medical Sciences, Rafsanjan, Iran. Introduction: Health care staff can play an important role in changing nutritional habits and attitudes of a population. The aim of this study was to investigate the nutritional knowledge, attitude and practice among health workers in Rafsanjan University of Medical Sciences (RUMS) in 2016. MaterialsandMethods: In this descriptive study, 289 health- care staff working at health centers, health units, and health houses of the RUMS were selected by census method. Data gathering tool was a structured questionnaire completed by self-administered NKAP (Nutritional, Knowledge, Attitude and Practice study). Data were analyzed using chi-square, Fisher's exact test, one-way ANOVA followed by Turkey’s multiple comparisons test. Conclusion: The results of this study showed that participants had a well to excellent level of nutritional knowledge and practice. It seems that the nutritional training courses should be revised and updated particularly for male health workers with a lower degree of education or longer years of civil service. Popkin BM. Global nutrition dynamics: the world is shifting rapidly toward a diet linked with noncommunicable diseases AJCN 2006;84(2):289-98. Alwan A. Global status report on no communicable diseases 2010 Description of the global burden of NCDs, their risk factors and determinants. WHO )World Health Organization). Switzerland, Geneva. 2011; 51-4. 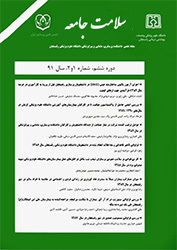 Sheikholeslam R, Kimiagar M, Siasi F, Abdollahi Z, Jazayeri A, Keyghobadi K, et al. Multidisciplinary intervention for reducing malnutrition among children in the Islamic Republic of Iran .EMHJ 2004;10(6):18-25. Ahadi Z, Heshmat R, Sanaei M, Shafiee G, Ghaderpanahi M, Homami MR, et al. Knowledge, attitude and practice of urban and rural households towards principles of nutrition in Iran: results of NUTRIKAP survey. Journal of Diabetes & Metabolic Disorders 2014;13(1):100. Mowe M, Bosaeus I, Rasmussen HH, Kondrup J, Unosson M, Rothenberg E, et al. Insufficient nutritional knowledge among health care workers? Clinical nutrition 2008;27(2):196-202. Allafi AR, Alajmi F, Al-Haifi A. Survey of nutrition knowledge of physicians in Kuwait. PHN 2013;16(7):1332-6. Al-Zahrani AM, Al-Raddadi RM. Nutritional knowledge of primary health care physicians in Jeddah, Saudi Arabia. Saudi Med J 2009;30(2):284-7. Hu SP, Wu MY, Liu JF. Nutrition knowledge, attitude and practice among primary care physicians in Taiwan. JACN 1997; 16(5): 439-42. Mirmiran P, Mohammadi-Nasrabadi F, Omidvar N, Hosseini-Esfahani F, Hamayeli-Mehrabani H, Mehrabi Y, et al. Nutritional knowledge, attitude and practice of Tehranian adults and their relation to serum lipid and lipoproteins: Tehran lipid and glucose study. ANM 2010;56(3):233-40. Lin W, Hang C-M, Yang H-C, Hung M-H. 2005-2008 Nutrition and Health Survey in Taiwan: the nutrition knowledge, attitude and behavior of 19-64 years old adults. APJCN 2011;20(2):309-18.